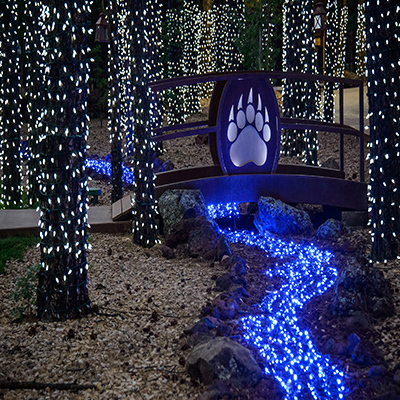 Get in the spirit of the Christmas season and enjoy the magic of Bearizona at night during Wild Wonderland! Mrs. Claus makes a special visit nightly, for Storytime at 6:00 p.m. and again at 7:00 p.m. in the Gift Shop. After Storytime, kids of all ages can take a photo with Mrs. Claus. Several of the park’s critters will stay up late to enjoy the cooler nights and will even get the chance to open their Christmas presents early! Bearizona’s program animals are eager to participate in the season’s festivities as well, and will be out for all to meet from 5:30 p.m. – 7:30 p.m. in the Gift Shop. Guests can purchase delicious Christmas goodies, and warm themselves up with seasonal beverages at Canyonlands restaurant, guests can stay warm by the outdoor fire pit and purchase s’mores to roast and toast to their delight. Wild Wonderland is closed on Christmas Eve and Christmas Day.